So, why are intelligent people in awe - and speechless? Sometimes we need to go back to the original source to find the true answer. If you have at least five minutes to think about this - I'd appreciate your feedback. Thinking outside of the box, rather than regurgitating information would be most helpful. The original mathematical problem and solution is written below. The required compass and straightedge only drawing is attached. I'd like to know how this solution can be proven wrong given the explanation and drawing I've provided. Please keep in mind, historically the original source of the problem and solution below does not include π. The Rhind Papyrus already states the correct solution to Squaring the Circle. The Rhind Papyrus #50 reads: A circular field has diameter 9 khet. What is its area? 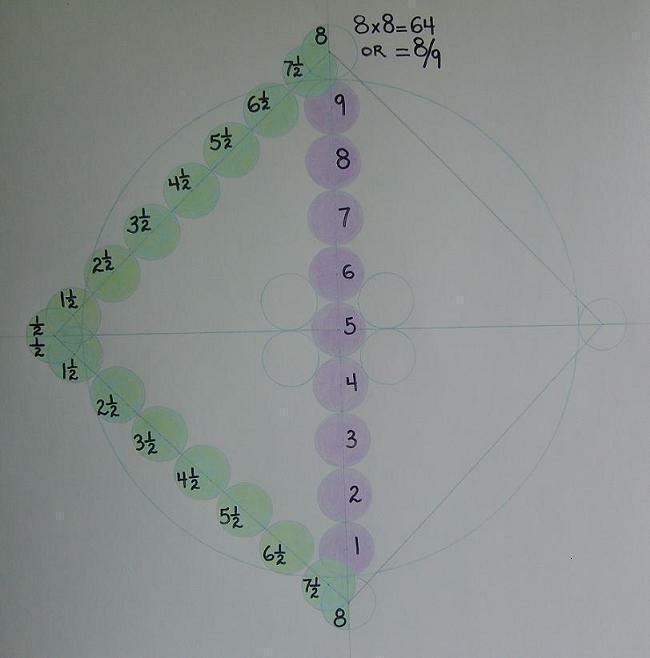 The written solution reads: Subtract 1/9 of the diameter which leaves 8 khet. The area is 8 multiplied by 8, or 64 setat. The Rhind Papyrus (1650BC) was scribed by Ahmes from previous writings, and it is the original proof of the problem and solution that exists. The original problem and solution does not include π. Ancients were simplistic & solved without π. π came later. The attached drawing proves this can be accomplished with only a compass and straight edge. (Any scale works - draw to fully understand). It's interesting that some people believe π has been in existence since the very beginning of time. Although, there isn't any clear proof of when π actually began. π did begin at a certain point in time, and was eventually accepted. I'm not in denial about the use of π - nor have I tried to redefine π. This is based on factual chronological order. The ancient problem and correct solution to Squaring the Circle was established long before π came along. It was many ages later that π retroactively made Squaring the Circle impossible. I have not redefined the written ancient problem and solution of the Rhind Papyrus #50. The problem and solution is already clear. It is a fact that the written problem and solution do not include π. The Rhind Papyrus #50 reads: A circular field has diameter 9 khet. What is its area? The written solution reads: Subtract 1/9 of the diameter which leaves 8 khet. The area is 8 multiplied by 8, or 64 setat. On a historical time line, this ancient problem and solution existed long before π was accepted. π does not in any way apply to the inception or original time period of Squaring the Circle. I have not redefined or denied any part of the original problem and solution. I've used the tools the ancients used - compass and straight edge only.